Via Just Quist werd ik gewezen op het boekwerk van Rosalind Krauss. Nu ging het iets specifieker over het hoofdstuk Grids uit dat boek. Dus Just stuurde me dat toe en vervolgens heb ik het gelezen. Een erg interessant artikel en daarom nu hier. Het gaat over de betekenis en herkomst van grids, een raster. In die zin is het inzicht van romantici als, ook formeel gezien, voorgangers van Mondriaan en Agnes Martin voor mij totaal nieuw. In the early part of this century there began to appear, first in France and then in Russia and in Holland, a structure that has remained emblematic of the modernist ambition within the visual arts ever since. Surfacing in pre-War cubist painting and subsequently becoming ever more stringent and manifest, the grid announces, among other things, modern art’s will to silence, its hostility to literature, to narrative, to discourse. As such, the grid has done its job with striking efficiency. The barrier it has lowered between the arts of vision and those of language has been almost totally successful in walling the visual arts into a realm of exclusive visuality and defending them against the intrusion of speech. The arts, of course, have paid dearly for this success, because the fortress they constructed on the foundation of the grid has increasingly become a ghetto. Fewer and fewer voices from the general critical establishment have been raised in support, appreciation, or analysis of the contemporary plastic arts. Yet it is safe to say that no form within the whole of modern aesthetic production has sustained itself so relentlessly while at the same time being so impervious to change. It is not just the sheer number of careers that have been devoted to the exploration of the grid that is impressive, but the fact that never could exploration have chosen less fertile ground. As the experience of Mondrian amply demonstrates, development is precisely what the grid resists. But no one seems to have been deterred by that example, and modernist practice continues to generate ever more instances of grids. There are two ways in which the grid functions to declare the modernity of modern art. One is spatial; the other is temporal. In the spatial sense, the grid states the autonomy of the realm of art. Flattened, geometricized, ordered, it is antinatural, antimimetic, antireal. It is what art looks like when it turns its back on nature. In the flatness that results from its coordinates, the grid is the means of crowding out the dimensions of the real and replacing them with the lateral spread of a single surface. In the overall regularity of its organization, it is the result not of imitation, but of aesthetic decree. Insofar as its order is that of pure relationship, the grid is a way of abrogating the claims of natural objects to have an order particular to themselves; the relationships in the aesthetic field are shown by the grid to be in a world apart and, with respect to natural objects, to be both prior and final. The grid declares the space of art to be at once autonomous and autotelic. In the temporal dimension, the grid is an emblem of modernity by being just that: the form that is ubiquitous in the art of our century, while appearing nowhere, nowhere at all, in the art of the last one. In that great chain of reactions by which modernism was born out of the efforts of the nineteenth century, one final shift resulted in breaking the chain. By “discovering” the grid, cubism, de Stijl, Mondrian, Malevich , landed in a place that was out of reach of everything that went before. Which is to say, they landed in the present, and everything else was declared to be the past. One has to travel a long way back into the history of art to find previous examples of grids. One has to go to the fifteenth and sixteenth centuries, to treatises on perspective and to those exquisite studies by Uccello or Leonardo or Dürer, where the perspective lattice is inscribed on the depicted world as the armature of its organization. But perspective studies are not really early instances of grids. Perspective was, after all, the science of the real, not the mode of withdrawal from it. Perspective was the demonstration of the way reality and its representation could be mapped onto one another, the way the painted image and its real-world referent did in fact relate to one another-the first being a form of knowledge about the second. Everything about the grid opposes that relationship, cuts it off from the very beginning. Unlike perspective, the grid does not map the space of a room or a landscape or a group of figures onto the surface of a painting. Indeed, if it maps anything, it maps the surface of the painting itself. It is a transfer in which nothing changes place. The physical qualities of the surface, we could say, are mapped onto the aesthetic dimensions of the same surface. And those two planes-the physical and the aesthetic-are demonstrated to be the same plane: coextensive, and, through the abscissas and ordinates of the grid, coordinate. Considered in this way, the bottom line of the grid is a naked and determined materialism. But if it is materialism that the grid would make us talk about-and there seems no other logical way to discuss it-that is not the way that artists have ever discussed it. If we open any tract-Plastic Art and Pure Plastic Art or The Non-Objective World, for instance-we will find that Mondrian and Malevich are not discussing canvas or pigment or graphite or any other form of matter. They are talking about Being or Mind or Spirit. From their point of view, the grid is a staircase to the Universal, and they are not interested in what happens below in the Concrete. Or, to take a more up-to-date example, we could think about Ad Reinhardt who, despite his repeated insistence that “Art is art”, ended up by painting a series of black nine-square grids in which the motif that inescapably emerges is a Greek cross. There is no painter in the West who can be unaware of the symbolic power of the cruciform shape and the Pandora’s box of spiritual reference that is opened once one uses it. Now it is in this ambivalence about the import of the grid, an indecision about its connection to matter on the one hand or spirit on the other, that its earliest employers can be seen to be participating in a drama that extended well beyond the domain of art. That drama, which took many forms, was staged in many places. One of them was a courtroom, where early in this century, science did battle with God, and, reversing all earlier precedents, won. The result, we were told by the loser’s representative, would have the direst of consequences: the result would surely be that we would “inherit the wind.” Nietzsche had expressed this earlier and with a somewhat more comic cast when he wrote, “We wished to awaken the feeling of man’s sovereignty by showing his divine birth: this path is now forbidden, since a monkey stands at the entrance.” Through the Scopes trial, the split between spirit and matter that was presided over by nineteenth-century science became the legitimate heritage of twentieth-century school children. But it was, of course, no less the heritage of twentieth-century art. Given the absolute rift that had opened between the sacred and the secular, the modern artist was obviously faced with the necessity to choose between one mode of expression and the other. The curious testimony offered by the grid is that at this juncture he tried to decide for both. In the increasingly desacralized space of the nineteenth century, art had become the refuge for religious emotion; it became, as it has remained, a secular form of belief. Although this condition could be discussed openly in the late nineteenth century, it is something that is inadmissible in the twentieth, so that by now we find it indescribably embarrassing to mention art and spirit in the same sentence. The peculiar power of the grid, its extraordinarily long life in the specialized space of modern art, arises from its potential to preside over this shame: to mask and to reveal it at one and the same time. In the cultist space of modern art, the grid serves not only as emblem but also as myth. For like all myths, it deals with paradox or contradiction not by dissolving the paradox or resolving the contradiction, but by covering them over so that they seem (but only seem) to go away. The grid’s mythic power is that it makes us able to think we are dealing with materialism (or sometimes science, or logic) while at the same time it provides us with a release into belief (or illusion, or fiction). The work of Reinhardt or Agnes Martin would be instances of this power. And one of the important sources of this power is the way the grid is, as I said before, so stridently modern to look at, seeming to have left no place of refuge, no room on the face of it, for vestiges of the nineteenth century to hide. In suggesting that the success’ of the grid is somehow connected to its structure as myth, I may of course be accused of stretching a point beyond the limits of common sense, since myths are stories, and like all narratives they unravel through time, whereas grids are not only spatial to start with, they are visual structures that explicitly reject a narrative or sequential reading of any kind. But the notion of myth I am using here depends on a structuralist mode of analysis, by which the sequential features of a story are rearranged to form a spatial organization. The reason the structuralists do this is that they wish to understand the function of myths; and this function they see as the cultural attempt to deal with contradiction. By spatializing the story-into vertical columns, for example-they are able to display the features of the contradiction and to show how these underlie the attempts of a specific mythical tale to paper over the opposition with narrative. Thus, in analyzing a variety of creation myths, Levi-Strauss finds the presence of a conflict between earlier notions of man’s origins as a process of autochthony (man born from the earth, like plants), and later ones involving the sexual relations between two parents. Because the earlier forms of belief are sacrosanct they must be maintained even though they violate commonsense views about sexuality and birth. The function of the myth is to allow both views to be held in some kind of para-logical suspension. The justification of this violation of the temporal dimension of the myth arises, then, from the results of structural analysis: namely, the sequential progress of the story does not achieve resolution but rather repression. That is, for a given culture, the contradiction is a powerful one, one that will not go away, but will only go, so to speak, underground. So the vertical columns of structuralist analysis are a way of unearthing the unmanageable oppositions that promoted the making of the myth in the first place. We could analogize this procedure to that of psychoanalysis, where the “story” of a life is similarly seen as an attempt to resolve primal contradictions that nevertheless remain in the structure of the unconscious. Because they are there as repressed elements, they function to promote endless repetitions of the same conflict. Thus another rationale for the vertical columns (the spatialization of the “story”) emerges from the fact that it is useful to see the way each feature of the story (for structuralist analysis these are called mythemes) burrows down, independently, into the historical past: in the case of psychoanalysis this is the past of the individual; for the analysis of myth, this is the past of the culture or the tribe. Therefore, although the grid is certainly not a story, it is a structure, and one, moreover, that allows a contradiction between the values of science and those of spiritualism to maintain themselves within the consciousness of modernism, or rather its unconscious, as something repressed. In order to continue its analysistic assess the very success of the grid’s capacities to repress-we might follow the lead of the two analytical procedures I have just mentioned. This would mean burrowing along the site of each part of the contradiction down into its historical foundations. No matter how absent the grid was in nineteenth-century art, it is precisely into these historical grounds that we must go to find its sources. Now, although the grid itself is invisible in nineteenth-century painting, it is not entirely absent from a certain kind of accessory literature to which that painting paid an increasing amount of attention. This is the literature of physiological optics. By the nineteenth century the study of optics had split into two parts. One half consisted of the analysis of light and its physical properties: its motion; its refractive features as it was passed through lenses, for example; its capacity to be quantified, or measured. In conducting such studies, scientists presupposed that these were features of light as such, that is, light as it existed independent of human (or animal) perception. The second branch of optics concentrated on the physiology of the perceiving mechanism; it was concerned with light and color as they are seen. It is this branch of optics that was of immediate concern to artists. Whatever their sources of information-whether Chevreul, or Charles Blanc, or Rood, Helmholtz, or even Goethe3 -painters had to confront a particular fact: the physiological screen through which light passes to the human brain is not transparent, like a window pane; it is, like a filter, involved in a set of specific distortions. For us, as human perceivers, there is an unbreachable gulf between “real” color and “seen” color. We may be able to measure the first; but we can only experience the second. And this is because, among other things, color is always involved in interaction-one color reading onto and affecting its neighbor. Even if we are only looking at a single color, there is still interaction, because the retinal excitation of the afterimage will superimpose on the first chromatic stimulus that of a second, which is its complementary. The whole issue of complementary colors, along with the whole edifice of color harmonics that painters constructed on its basis, was thus a matter of physiological optics. An interesting feature of treatises written on physiological optics is that they were illustrated with grids. Because it was a matter of demonstrating the interaction of specific particles throughout a continuous field, that field was analyzed into the modular and repetitive structure of the grid. So for the artist who wished to enlarge his understanding of vision in the direction of science, the grid was there as a matrix of knowledge. By its very abstraction, the grid conveyed one of the basic laws of knowledge-the separation of the perceptual screen from that of the “real” world. Given all of this, it is not surprising that the grid-as an emblem of the infrastructure of vision-should become an increasingly insistent and visible feature of neo-impressionist painting, as Seurat, Signac, Cross, and Luce applied themselves to the lessons of physiological optics. Just as it is not surprising that the more they applied these lessons, the more “abstract” their art became, so that as the critic Felix Feneon observed of the work of Seurat, science began to yield its opposite, which is symbolism. The symbolists themselves stood adamantly opposed to any traffic at all between art and science, or for that matter, between art and “reality.” The object of symbolism was metaphysical understanding, not the mundane; the movement supported those aspects of culture that were interpretations rather than imitations of the real. And so symbolist art would be the last place, we might think, to look for even an incipient version of grids. But once again we would be wrong. The grid appears in symbolist art in the form of windows, the material presence of their panes expressed by the geometical intervention of the window’s mullions. The symbolist interest in windows clearly reaches back into the early nineteenth century and romanticism.4 But in the hands of the symbolist painters and poets, this image is turned in an explicitly modernist direction. For the window is experienced as simultaneously transparent and opaque. As a transparent vehicle, the window is that which admits light-or spiritinto the initial darkness of the room. But if glass transmits, it also reflects. And so the window is experienced by the symbolist as a mirror as well-something that freezes and locks the self into the space of its own reduplicated being. Flowing and freezing; glace in French means glass, mirror, and ice; transparency, opacity, and water. In the associative system of symbolist thought this liquidity points in two directions. First, towards the flow of birth-the amniotic fluid, the “source”-but then, towards the freezing into stasis or death-the unfecund immobility of the mirror. For Mallarme, particularly, the window functioned as this complex, polysemic sign by which he could also project the “crystallization of reality into art.”5 Mallarme’s Les Fenetres dates from 1863; Redon’s most evocative window, Le Jour, appeared in 1891 in the volume Songes. If the window is this matrix of ambi- or multivalence, and the bars of the windows-the grid-are what help us to see, to focus on, this matrix, they are themselves the symbol of the symbolist work of art. They function as the multilevel representation through which the work of art can allude, and even reconstitute, the forms of Being. I do not think it is an exaggeration to say that behind every twentiethcentury grid there lies-like a trauma that must be repressed-a symbolist window parading in the guise of a treatise on optics. Once we realize this, we can also understand that in twentieth-century art there are “grids” even where we do not expect to find them: in the art of Matisse, for example (his Windows), which onlyadmits openly to the grid in the final stages of the papiers decoupies. Because of its bivalent structure (and history) the grid is fully, even cheerfully, schizophrenic. I have witnessed and participated in arguments about whether the grid portends the centrifugal or centripetal existence of the work of art.6 Logically speaking, the grid extends, in all directions, to infinity. Any boundaries imposed upon it by a given painting or sculpture can only be seenaccording to this logic-as arbitrary. By virtue of the grid, the given work of art is presented as a mere fragment, a tiny piece arbitrarily cropped from an infinitely larger fabric. Thus the grid operates from the work of art outward, compelling our acknowledgement of a world beyond the frame. This is the centrifugal reading. The centripetal one works, naturally enough, from the outer limits of the aesthetic object inward. The grid is, in relation to this reading a re-presentation of everything that separates the work of art from the world, from ambient space and from other objects. The grid is an introjection of the boundaries of the world into the interior of the work; it is a mapping of the space inside the frame onto itself. It is a mode of repetition, the content of which is the conventional nature of art itself. The work of Mondrian, taken together with its various and conflicting readings, is a perfect example of this dispute. Is what we see in a particular painting merely a section of an implied continuity, or is the painting structured as an autonomous, organic whole? Given the visual, or formal, consistency of Mondrian’s mature style and the passion of his theoretical pronouncements, we would think that work of this sort would have to hold to one position or the other; and because the chosen position contains a definition about the very nature and goals of art, one would think that an artist would certainly not want to confuse the issue by seeming to imply both. Yet that is exactly what Mondrian does. There are certain paintings that are overwhelmingly centrifugal, particularly the vertical and horizontal grids seen within diamond-shaped canvases-the contrast between frame and grid enforcing the sense of fragmentation, as though we were looking at a landscape through a window, the frame of the window arbitrarily truncating our view but never shaking our certainty that the landscape continues beyond the limits of what we can, at that moment, see. But other works, even from the same years, are just as explicitly centripetal. In these, the black lines forming the grid are never allowed actually to reach the outer margins of the work, and this cesura between the outer limits of the grid and the outer limits of the painting forces us toread the one as completely contained within the other. And of course, for the centripetal practice, the opposite is true. Concentrating on the surface of the work as something complete and internally organized, the centripetal branch of practice tends not to dematerialize that surface, but to make it itself the object of vision. Here again one finds one of those curious paradoxes by which the use of the grid is marked at every turn. The beyond-theframe attitude, in addressing the world and its structure, would seem to trace its lineage back to the nineteenth century in relation to the operations of science, and thus to carry the positivist or materialist implications of its heritage. The withinthe- frame attitude, on the contrary, involved as it is with the purely conventional and autotelic reading of the work of art, would seem to issue from purely symbolist origins, and thus to carry all those readings which we oppose to “science” or “materialism”-readings which inflect the work as symbolic, cosmological, spiritual, vitalist. Yet we know that by and large this is not true. 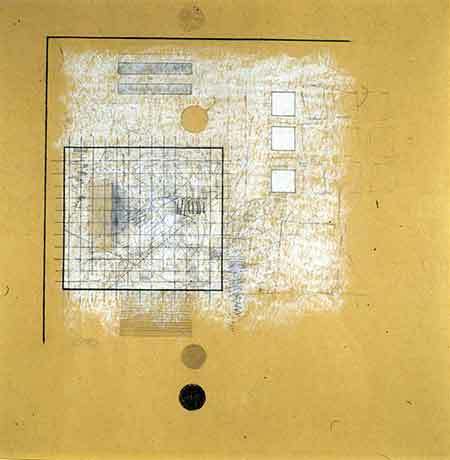 Through a kind of short-circuiting of this logic, the within-the-frame grids are generally far more materialist in character (take such different examples as Alfred Jensen and Frank Stella); while the beyond-the-frame examples often entail the dematerialization of the surface, the dispersal of matter into perceptual flicker or implied motion. And we also know that this schizophrenia allows for many artists-from Mondrian, to Albers, to Kelly, to LeWitt-to think about the grid in both ways atonce. In discussing the operation and character of the grid within the general field of modern art I have had recourse to words like repression or schizophrenia. Since these terms are being applied to a cultural phenomenon and not to individuals, they are obviously not intended in their literal, medical sense, but only analogically: to compare the structure of one thing to the structure of another. The terms of this analogy were clear, I hope, from the discussion of the parallel structures and functions of both grids as aesthetic objects and myths. But one further aspect of this analogy still needs to be brought out, and that is the way in which this psychological terminology functions at some distance from that of history. What I mean is that we speak of the etiology of a psychological condition, not the history of it. History, as we normally use it, implies the connection of events through time, a sense of inevitable change as we move from one event to the next, and the cumulative effect of change which is itself qualitative, so that we tend to view history as developmental. Etiology is not developmental. It is rather an investigation into the conditions for one specific change-the acquisition of disease-to take place. In that sense etiology is more like looking into the background of a chemical experiment, asking when and how a given group of elements came together to effect a new compound or to precipitate something out of a liquid. For the etiology of neuroses, we may take a “history” of the individual, to explore what went into the formation of the neurotic structure; but once the neurosis is formed, we are specifically enjoined from thinking in terms of “development,” and instead we speak of repetition. With regard to the advent of the grid in twentieth-century art, there is the need to think etiologically rather than historically. Certain conditions combined to precipitate the grid into a position of aesthetic preeminence. We can speak of what those things are and how they came together throughout the nineteenth century and then spot the moment of chemical combination, as it were, in the early decades of the twentieth. But once the grid appears it seems quite resistant to change. The mature careers of Mondrian or Albers are examples of this. No one would characterize the course of decade after decade of their later work as developmental. But by depriving their world of development, one is obviously not depriving it of quality. There is no necessary connection between good art and change, no matter how conditioned we may be to think that there is. Indeed, as we have a more and more extended experience of the grid, we have discovered that one of the most modernist things about it is its capacity to serve as a paradigm or model for the antidevelopmental, the antinarrative, the antihistorical. This has occurred in the temporal as well as the visual arts: in music, for example, and in dance. It is no surprise then, that as we contemplate this subject, there should have been announced for next season a performance project based on the combined efforts of Phil Glass, Lucinda Childs, and Sol LeWitt: music, dance,and sculpture, projected as the mutually accessible space of the grid. 1. Success here refers to three things at once: a sheerly quantitative success, involving the number of artists in this century who have used grids; a qualitative success through which the grid has become the medium for some of the greatest works of modernism; and an ideological success, in that the grid is able in a work of whatever quality-to emblematize the Modern. 3. Michel-Eugene Chevreul, De la loi du contraste simultane des couleurs, Paris, 1839, translated into English in 1872; Charles Blanc, Grammaire des arts du dessin, Paris, 1867, translated into English in 1879; Ogden N. Rood, Modern Chromatics, New York, 1879, translated into French, 1881; Hermann von Helmholtz, Handbuch der physiologischen Optik, Leipzig, 1867; Johann Wolfgang von Goethe, Farbenlehre, 1810, translated into English, 1840. 4. See Lorenz Eitner, “The Open Window and the Storm-Tossed Boat: an Essay in the Iconography of Romanticism,” Art Bulletin, XXXVII (December 1955), 281-90. 5. Robert G. Cohn, “Mallarme’s Windows,” Yale French Studies, no. 54 (1977), 23-31. 6. This literature is far too extensive to be cited here; a representative and excellent example of this discussion is, John Elderfield, “Grids,” Artforum, X (May 1972), 52-9.